One of the best farming games is already here and ready to represent a really unique collaboration of two game genres " Farming game" and "Time manager" for all farmers, who dreams of building his own unique farm and lift his business to unprecedented heights! Farming has changed, for the better! Join Scarlett as she puts robots to work on her farm lands, as technology and hard work meet in Farm Frenzy 3: American Pie! As the world advances in technology and efficiency, you must do whatever it takes to stay competitive in the marketplace. And Scarlett knows a thing or two about being competitive! ◇ 90 beautiful, frantically fun levels! ◇ New, more efficient buildings with numerous upgrades! ◇ A lot of quirky lovely animals makes things more fun! Funny animals to care for! 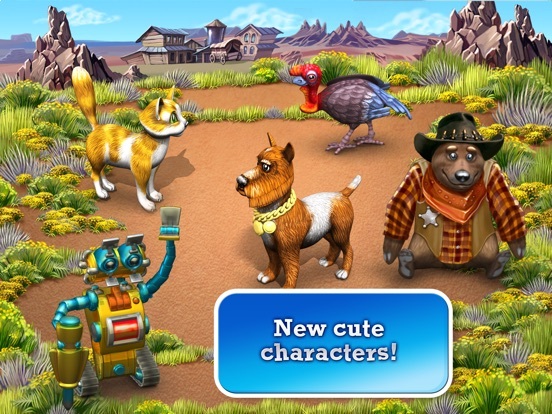 Can you keep up with the booming advancements in technology as you grow crops, feed your cute animals, collect produce, manufacture goods and trade goods on market? Of course, you can! All neighbors and friends will envy your harvest! Just don't let the zany new animations distract you too much from the task at hand! 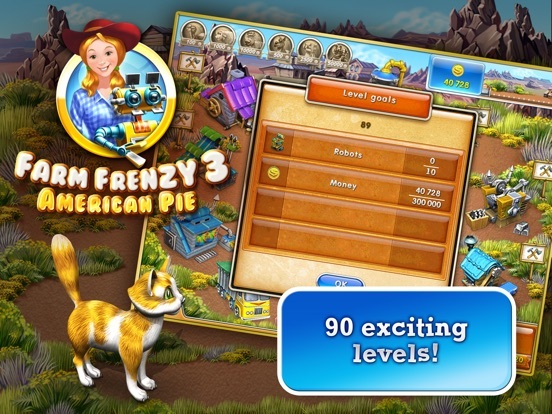 Featuring 90 brand new levels, an entertaining assortment of never-before-seen funny characters, to go along with new buildings and challenges, Farm Frenzy 3: American Pie is sure to keep you entertained for a long time to come! Being a true farmer isn't so easy, you need to build and upgrade buildings, grow a crop, harvest a crop, collect animals, producing cakes, wool, chickens, sheep, cows, and trade these fresh goods. 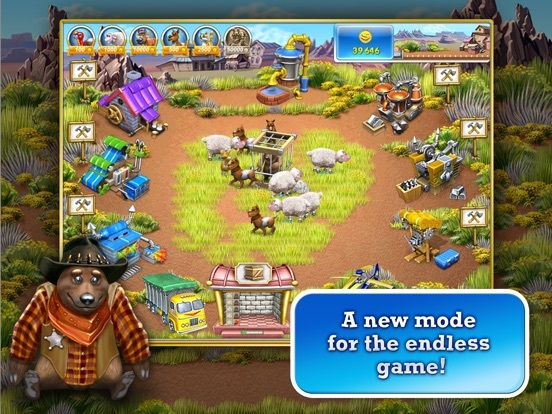 Discover new territory, make your orders and quick deсisions and, of course, customize and manage your play style and build a farm of your dream! Start your adventure, go through unlimited levels, reach all goals and funny tasks, make a profit and prove everyone who is the best farmer in America. Claim the Top, take your glory and your family will be very proud of you! This fantastic farming game for girls and boys, kids, teenagers, and adults, contains exciting various challenges, cute characters, and smart content. 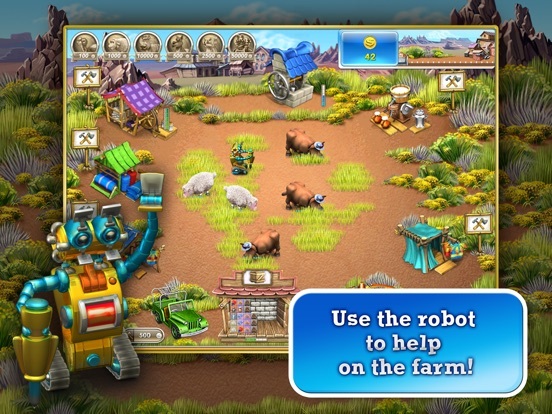 Please, welcome to enjoy this one of the best farming games on your mobile device! 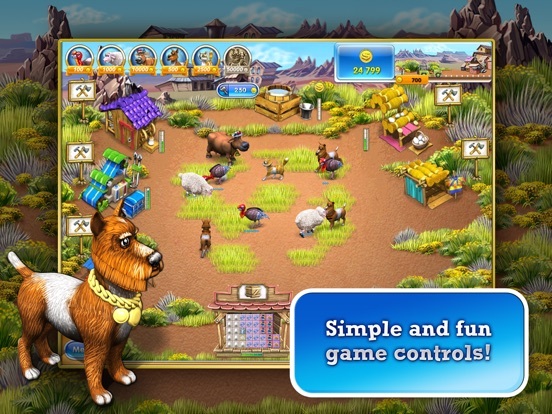 Play the best games from "Alawar", the creators of such games as Beholder, Farm Frenzy, The Treasures Of Montezuma, House of 1000 doors, on App Store! Update for iOs 11. Play and enjoy your favorite game!